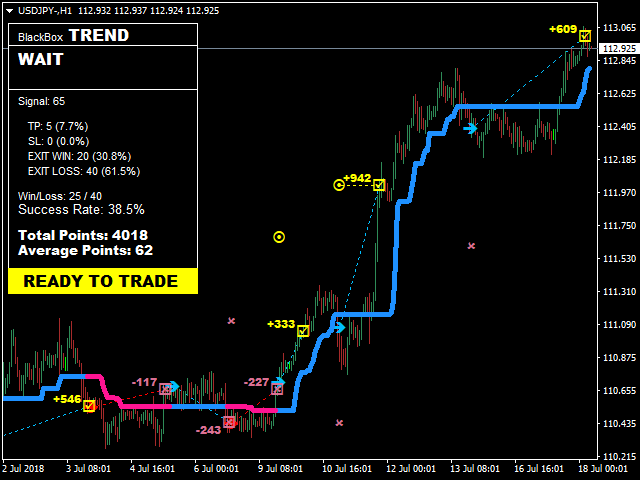 "BlackBox Trend" provides open and close signals by calculating trend. Its smart algorithm detects the trend, filters out market noise and gives entry signals with take profit and stop loss levels. The indicator sends notification when new signal is produced. "BlackBox Trend" simplifies the decision making process by detecting trend. 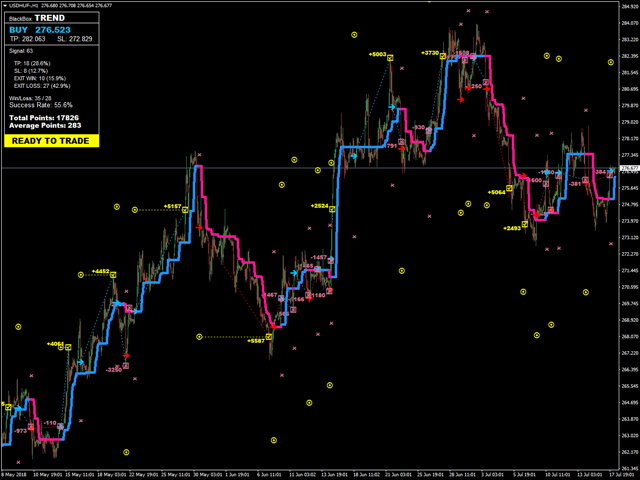 Easy, effective and visual trend detection. Uses very less CPU so can be used on multiple charts. 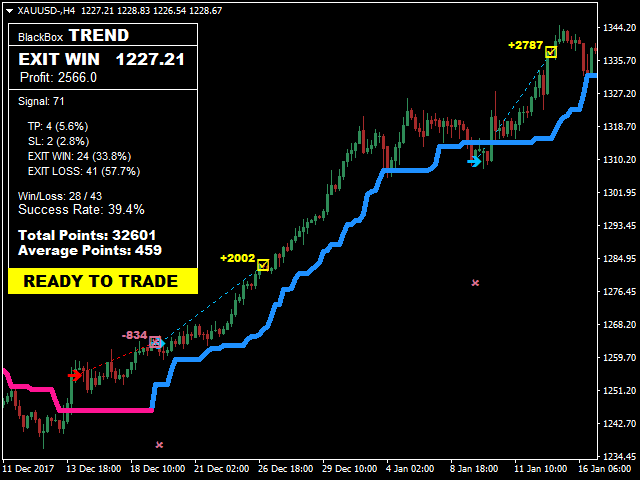 Statistics calculation following the entry signal, take profit, stop loss and exit signal. There are no complicated rules. Easy 3 steps! 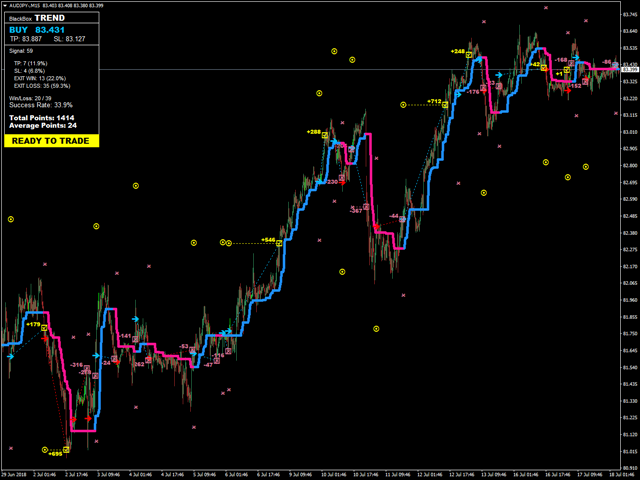 If statistics result is "READY TO TRADE", you may enter your signal. If the result is "WAIT", please wait for good statistic results. 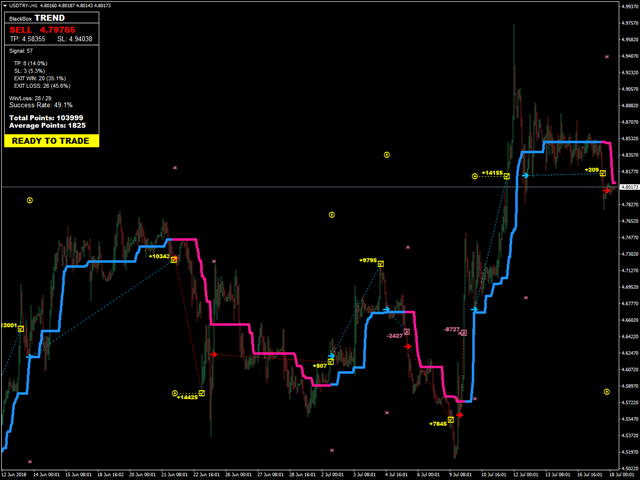 Please set Take Profit and Stop Loss levels. These levels are provided with entry signal. 4 different exit types. Please exit when you get one of them. 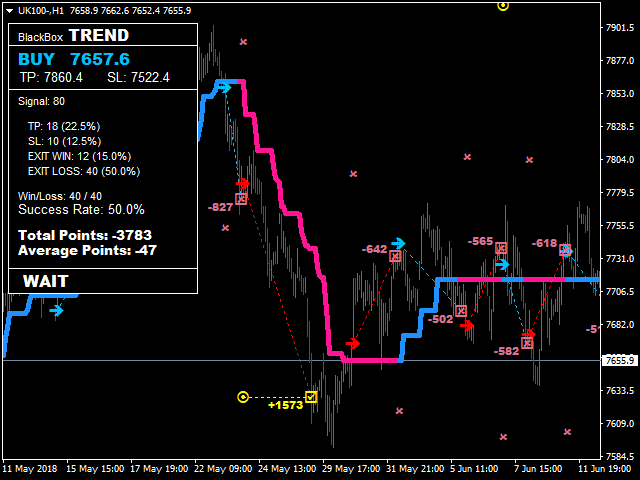 EXIT WIN: The position is closed in positive result before reached to TP. 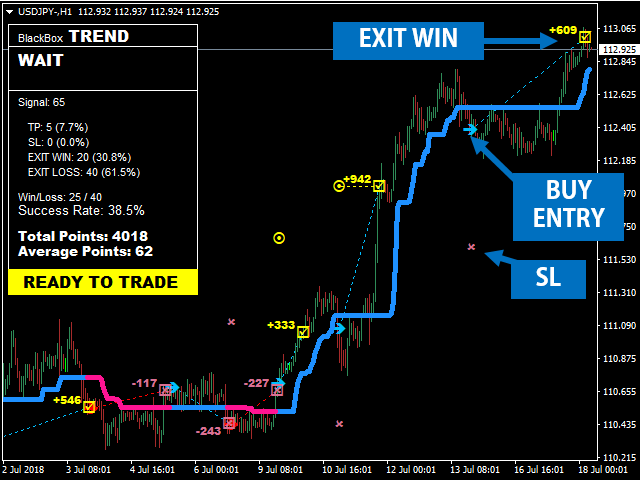 EXIT LOSS: The position is closed in negative result before reached to SL. Signal: The total number of past signals. 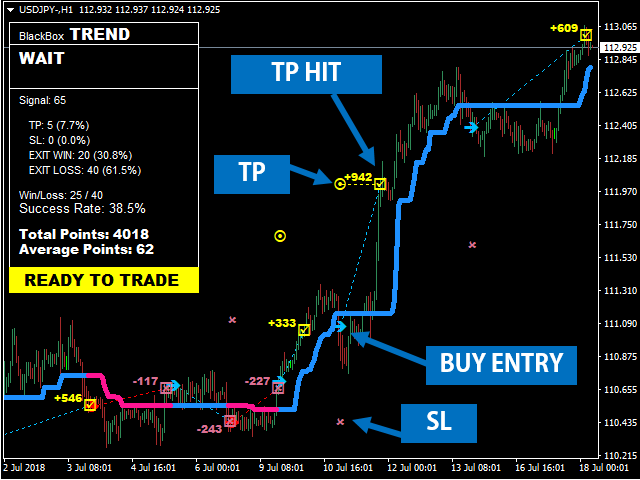 TP: The total number of past positive results by Take Profit and its percentage in all signals. 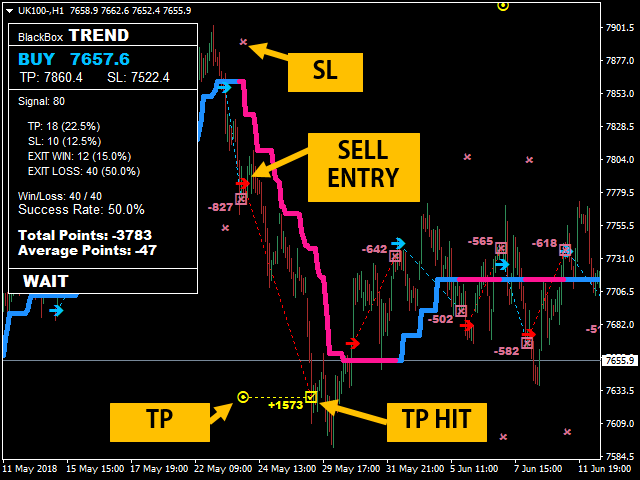 SL: The total number of past negative results by Stop Loss and its percentage in all signals. 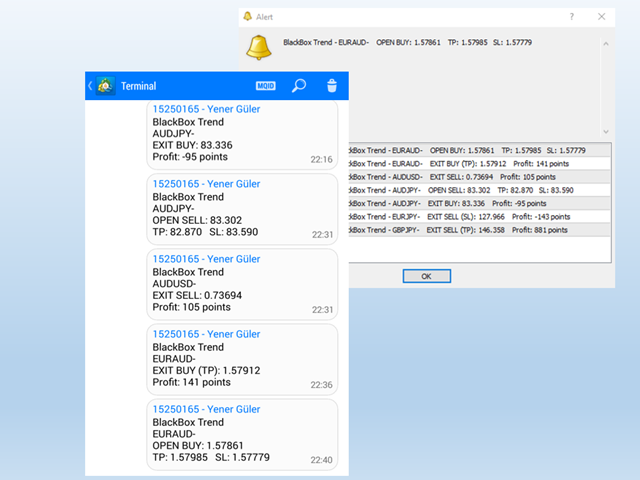 EXIT WIN: The total number of past positions are closed in positive result before reached to TP and its percentage in all signals. EXIT LOSS: The total number of past positions are closed in negative result before reached to SL and its percentage in all signals. Win/Loss: Total positive results / Total negative results. Success Rate: Percentage (%) of past positive results. Total Points: Total profit in points. Average Points: Average profit in points. 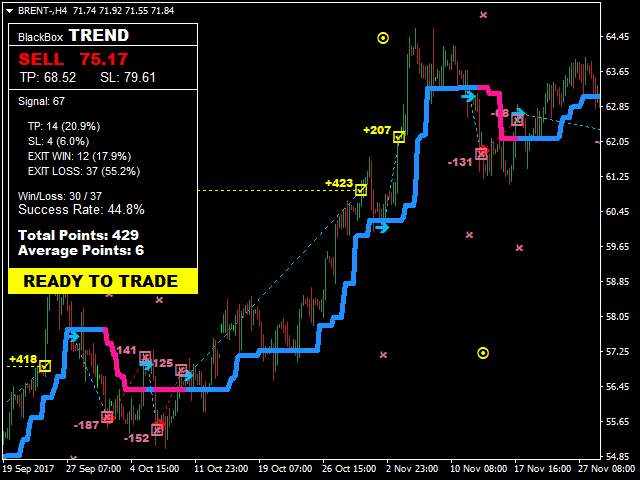 If it is bigger than zero, statistic result is "READY TO TRADE". If it is not, statistic result is "WAIT". Period: Trend detection period (default: 34). Increasing this value will give less entry signal but increases success rate. Decreasing this value will give more entry signal but decreases success rate. TakeProfit Factor - multiplier used to calculate take profit levels (default: 1.5). StopLoss Factor - multiplier used to calculate stop loss levels (default: 1.0). 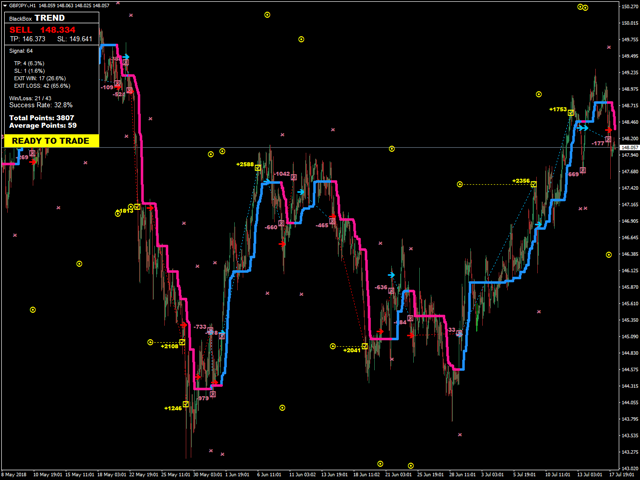 Sound Alerts: When it is true, it will play sound file when a signal is produced.